Sergey Kruk in front of a diagram of the metamaterial structure. Photo: Stuart Hay, ANU. Physicists have discovered radical new properties in a nanomaterial that could help in the development of highly efficient thermophotovoltaic cells, which convert radiated heat into electricity. The research team from the Australian National University (ANU) and the University of California, Berkeley, demonstrated a new artificial material, or metamaterial, that glows in an unusual way when heated. They report this new material in a paper in Nature Communications. "Thermophotovoltaic cells have the potential to be much more efficient than solar cells," said lead author Sergey Kruk from the ANU Research School of Physics and Engineering. "Our metamaterial overcomes several obstacles and could help to unlock the potential of thermophotovoltaic cells." Thermophotovoltaic cells have been predicted to be more than two times more efficient than conventional solar cells. They do not need direct sunlight to generate electricity, but instead harvest heat from their surroundings in the form of infrared radiation. They can be combined with a burner to produce power on-demand or can recycle heat radiated by hot engines. The team's novel metamaterial is made of tiny nanoscale structures of gold and magnesium fluoride, and can radiate heat in specific directions. 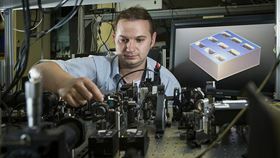 The geometry of the metamaterial can also be tweaked to emit radiation in a specific spectral range, in contrast to standard materials that emit their heat in all directions as a broad range of infrared wavelengths. All of which make this metamaterial ideal for use as a heat emitter paired with a thermophotovoltaic cell. This project started when Kruk predicted that the new metamaterial would have these surprising properties. The ANU team then worked with scientists at the University of California, Berkeley, who have unique expertise in manufacturing such materials. "To fabricate this material the Berkeley team were operating at the cutting edge of technological possibilities," Kruk said. "The size of individual building block of the metamaterial is so small that we could fit more than twelve thousand of them on the cross-section of a human hair." The key to the metamaterial's remarkable behavior is that it possesses a novel physical property known as magnetic hyperbolic dispersion. Dispersion describes the interaction of light with materials, and can be visualized as a three-dimensional surface representing how electromagnetic radiation propagates in different directions. The dispersion surfaces of natural materials such as glass or crystals take simple forms: spherical or ellipsoidal. The dispersion of the new metamaterial is drastically different and takes a hyperbolic form. This arises from the material's remarkably strong interactions with the magnetic component of light at infrared wavelengths. The efficiency of thermophotovoltaic cells combined with this metamaterial could be further improved if the emitter and receiver have a tiny, nanoscale gap between them. In this configuration, radiative heat transfer between them could be more than 10 times more efficient than between conventional materials. This story is adapted from material from the Australian National University, with editorial changes made by Materials Today. The views expressed in this article do not necessarily represent those of Elsevier. Link to original source.